Comparing acrylic stucco and traditional stucco is a good thing to talk about because there is a lot of confusion about the topic, due to a number of different things like multiple names for both types, different materials that are used, the price of the material and the labor involved… You get the picture. There are a few key differences to each material and laying them out side-by-side will make it much easier to see the differences. Let’s go over some of the basics and by the end of the article you will have a much better understanding of what each type of material is capable of and what you would like to put on your own home. Aliases: Acrylic stucco can also be referred to as synthetic stucco, elastomeric stucco finish and a number of different terms, when you include manufacturer’s special names for their particular synthetic stucco products but are all basically the same. Aliases: Other names include: classic stucco, hard coat stucco, cement stucco finish, hard coat finish and a few other ones. 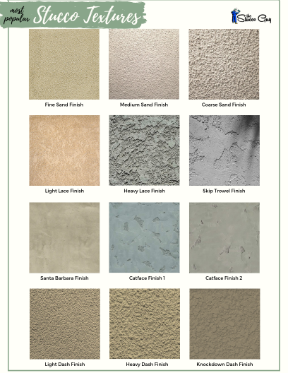 Like the synthetic stucco, manufacturer’s have special products that will have more names as well, but are the same thing. Made Out Of: The acrylics are made from… you guessed it acrylic resins and/or polymers that are basically like a thin Elmers glue. It resembles paint, in a way, but a very high quality one, that has sand in it, to give the finish a little more definition. Made Out Of: Traditional stucco is made from Portland Cement and Lime and looks and feels like it. It’s main ingredients are cement, sand (white usually), lime and water. So the two only share sand as a common material used for both. Comes In: Acrylics come in 5 gallon buckets and are typically around 50-70 pounds. 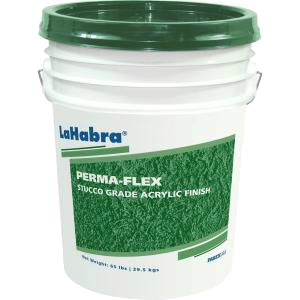 Unlike traditional stucco, these are wet mixes that are white when they are unmixed, but can be pre-mixed by a manufacturer, if requested. Comes In: You can find cement based stucco in bags, just like you would concrete at the Home Depot, for instance. They are usually around 80-90 lb. bags and come in a dry, powder-like form, when they are unmixed. Cost: The cost for synthetic stucco is higher than traditional stucco and averages out around $40-$50 per 5 gallon bucket. A bucket will cover about 100-250 sq. feet, depending on what texture you choose to go with. This averages out to be about $.25-$.50 a square foot, (rough estimate). Cost: Traditional stucco is cheaper than acrylics and costs around $10-$15 for a 80-90 lb. bag. A 90 lb. bag can cover approximately 100-180 square feet, depending on the base coat, type of finish and application techniques. This breaks down to about $.05-$.10 a square foot (rough estimate). Textures: You can achieve many different textures with acrylic products, not as many as traditional stucco, but still a wide variety to choose from. Some manufacturer’s have specialty textures that they make available that uses different sized aggregates (sand) to achieve custom finishes. This will vary from each manufacturer though. Textures: There is really no limit to the number of textures that you can achieve with traditional stucco. Textures range from smooth finishes to rough ones and everything in between. Different sized sand is used to achieve a wide range of textures ranging from smoother ones to very rough textures. Colors: The colors is one of acrylics strong points because it is very rich and vibrant and is very consistant, meaning that there is virtually no color variation from one bucket to another. There are so many colors to choose from and will differ from manufacturer to manufacturer. Colors are liquid and usually come in a small bottle or container. Colors: Since this is a cement based product, the color tends to not be as bright as acrylics, nor as consistent. 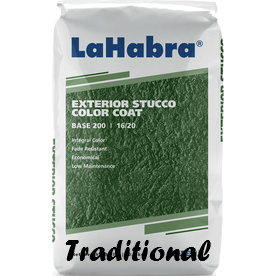 Each batch of stucco that is mixed will differ slightly and it is much harder to keep a consistent color with this product. Lighter colors are recommended for this application. The color is a powder and comes in a small bag or carton. How To Apply: The application process first starts with a primer coat, a paint is applied to the walls to seal the wall first and helps prolong the working time of the material at the same time. Next, the material is either troweled on or sprayed on and then troweled down in an even and uniform manner. Additional techniques are used to achieve certain textures and finishes. How To Apply: The walls are given a thorough soaking with water, in order to increase the working time and to ensure that the finish adheres to the substrate adequately. Just like the acrylics, it is applied using a hawk and trowel or can be sprayed on and is then troweled down tighter, for a uniform coat. Additional techniques are used to achieve specific textures after that. This material repels water and is described as water resistant. Does not repel water, but actually absorbs it and then eventually works its way out and dries out. This type of material is resistant to hairline cracks, mainly because of its elasticity and ability to stretch. Colors are bright and vibrant and there is virtually no color variation from bucket to bucket. Can be mixed using a drill with a paddle mixing attachment and does not require a mixer. Finish can be painted in the future if you ever wanted to change the color. The price of the material itself is quite a bit lower than synthetics are and can really save you money for larger projects. This material is very versatile and there really is no limit to the number of textures that can be achieved. The material can be found nearly everywhere, even at larger chain retailers like Lowes. The cost for acrylics is much higher when compared to a cement based finish, due to the polymers used in the material. Requires a little more skill to apply because it dries quite a bit faster than the traditional finish does. May have limited stock, depending on where you live, not all suppliers will stock it and it may be a special order material. Usually when you mix this material, you will want to mix enough bags for an entire wall, so there is minimal color variation, which requires a mixer. The color can change due to too much water, not enough, different application methods, etc. It requires additional mud stands and boards to hold the material, which isn’t required for acrylics.